ALL ORDERS ARE SUBJECT TO SHIPPING AND BOX FEES! Orders to Alaska, Hawaii, and other countries have higher shipping costs than the shopping cart reflects. Please read our Shipping Policies before ordering through PayPal.. Check Out Our Rope by Clicking Here. 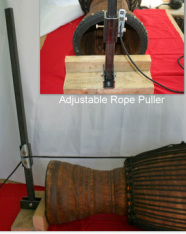 Includes Iron Bar Mounted on 2 Blocks of Wood with a Rope Puller that Can Be Adjusted on the Bar. 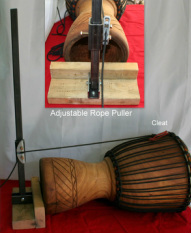 Diamond Puller with Clam Cleat that Attaches to Vertical Rope.